This functionality is provided by the fine folks at the Joshua Project. The Joshua Project is dedicated to finding all the people groups in the world, and getting a handle on their status in terms of how they have been influenced by the Gospel. In so doing, they help determine exactly how much work is left to be done in order to complete the Great Commission. Today’s Un-reached People of the Day are the Tatars of Ukraine. 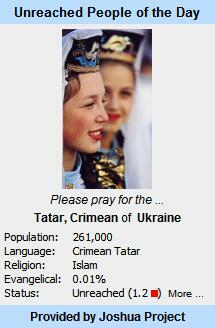 Based on the best info available, which is from 2002, about 0.01% of the Tatars are Christians. That means that if you woke up as a Tatar this morning — living in a Tatar community and engrossed in the Tatar culture — you would have to know 10,000 other Tatars in order to know one who is a follower of Jesus who could tell you about Him. The Tatar people are dear to my heart because I had the great privilege of spending a lot of time with a couple of them when I lived in Central Asia. I spent hours talking about Jesus and His great love and sacrifice, and I realized that sharing Christ with a cultural Muslim is a lot like trying to tear down a brick wall with a carpenter’s hammer… slow and painful work. In the end, I had two friends who chose to follow Christ. 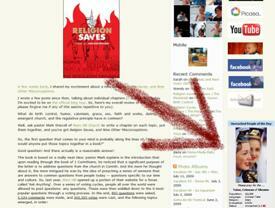 I enjoyed their hunger to learn all they could about Jesus, while it lasted. My team had to leave abruptly and I wasn’t able to keep contact with them in all the craziness. It’s very possible that they spent some time being detained for even knowing me and my teammates. I wonder if they think we abandoned them. I pray for them whenever I think of them. I ask God that they would remain faithful, even in such a dead and hopeless place. I pray that their experience with Him was deeper than the connection it gave them to some Americans. I pray that we will have some great conversations in heaven. Some day. Please pray with me for the Tatar people. I pray for the followers of Jesus among them to remain faithful and multiply. I pray for those who are lost among them to grow weary of the hopelessness of cultural Islam, and that God would open their eyes to see the beauty of the glory of God in the face of Jesus Christ. And I pray that God would send people to bring the message of the Gospel to them. 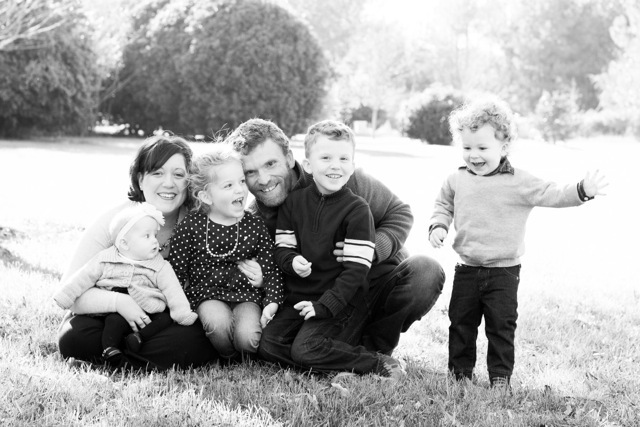 Do you believe God has specifically called you to stay in America and live a typical American life? Posted in Gospel, great commission, memories, uzbekistan and tagged christianity, islam, missions.